Right Family, Wrong Brother - Just when former model and single mother Caitlyn Drevier Reel has finally put her life on track after a divorce and a six-month stint in rehab, her ex-in-laws extend an invitation to spend Christmas with the family. After all, she reasons, her ex-husband Grant is constantly on the road with his band and it's only fair to allow them to get to know her young son. What Caitlyn isn't prepared for, however, is the spark of attraction she feels for Ridge, Grant's older brother, or the wonderful sense of belonging to their family once again. Ridge, who is recovering from his own personal heartache, seems to feel the same way. As they work together to ensure the success of the Winter Festival his parents have organized for their small Wyoming town, Caitlyn begins to envision a bright future. But will Grant's unexpected arrival at this family get-together keep her Christmas wish from coming true? Caitlyn's Christmas Wish is an inspirational romance novella that will have you reaching for a mug of hot cocoa as you get into the holiday mood. Laura L. Walker grew up in a large family in the beautiful Gila Valley of southern Arizona. From the time she was young, she spent hours drawing characters on paper and fantasizing about their adventures. Life became more serious, however, when she met her own hero at Northern Arizona University and they later became the parents of six children. In between spurts of grocery shopping, sewing costumes or quilts, transporting kids to practices, and making dinner, Laura still enjoys putting her imagination to good use. Laura is the author of two contemporary clean romances. Caitlyn's Christmas Wish is her first published novella. 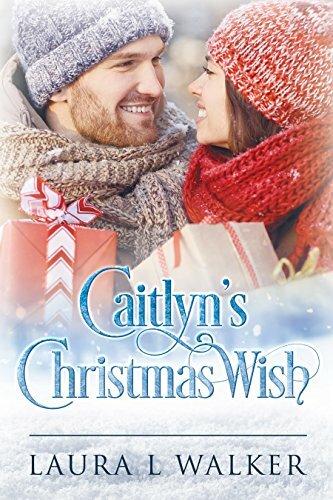 Caitlyn’s Christmas Wish is a sweet, but short novella that will warm your hearts. The characters are realistic with problems that seem insurmountable. As is typical with novellas, there were some areas of the plot that seemed not fully developed. Despite that, I enjoyed this book - a wonderful Christmas read. With this publication being an e-book and Christmas quickly approaching, it’s not too late to purchase if you want one last chance to read a light, Christmas novella with clean romance and a sweet ending. I would give this book four stars. I was given a complimentary copy of this book by the author in exchange for this review. All thoughts are my own.